The Horse Crucified and Risen (Horse Encyclopaedia) is a documentary showing the brutal historical relationship between horse and man. How man devised many cruel methods to try to control the horse. Methods, which today, are called 'tradition'. 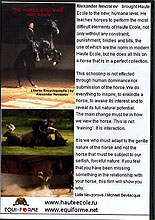 This DVD also describes and demonstrates what is possible with the horse. Exercises at liberty, natural collection, free of all restraints, with trust and willingness of the horse. This is Nevzorov Haute Ecole. Alexander Nevzorov brought Haute Ecole to the new, humane level. He teaches horses to perform the most difficult elements of Haute Ecole, but he does all this on a horse that is in a perfect collection. This schooling is not effected through human dominance nor submission of the horse. This does everything to inspire, to enkindle a horse, to awake its interest and to reveal its full natural potential. The main change must be in how we view the horse. This is not "training, it is interaction. It is we who must adapt to the gentle nature of the horse and not the horse that must be subject to our selfish, forceful nature. If you feel that you have been missing something in the relationship with your horse, this film will show you why. The DVD â€œThe Horse Crucified and Risenâ€� (The Horse Encyclopedia) by Alexander Nevzorov is really an outstanding thing. Nevzorov fomented a revolution in the minds of millions of people. Now every horsemanâ€™s life is divided into two parts: before and after â€œThe Horse Crucified and Risenâ€�. Nevzorov let them see in a different light what was treated as a norm for centuries. He pointed out the only true way to establish a relationship between horse and rider: a way without violence, a path which horse and rider would follow together. He gave everyone a chance to decide what position to take and to join those whose grandchildren will look into horseâ€™s eyes without any shame. Alexander Nevzorov, being a revolutionary and a brilliant thinker in essence, was one of a few people who understood the core of equestrian sport and was not afraid of calling things aloud by their names. At the 39th Worldfest - Houston Independent Film Festival, April 21-30, 2006, the film The Horse Crucified and Risen â€œHorse Encyclopediaâ€� received a Special Jury Award in the Documentary film category. The Jury not only considered it as an extremely bright work of great talent, but as well as the most honest and revolutionary film in essence. It was the first to show fairly and objectively the position of horses in the modern society and defined the problem of horse suffering in the equestrian sport. The Jury also noted its historical value and the brilliant directorâ€™s and operatorâ€™s work. Houston Film Festival is one of the largest in the world with 4500 entries received this year. Special Jury Award is the top award of the Festival for creative skills.